In an initiative begun by Canadian Foodgrains Bank, flood victims previously benefiting from agricultural training and loans for small-scale businesses are now continuing to be supported through the distribution of much needed food aid. For the second year in a row, heavy monsoon rains have caused severe flooding in Pakistan's southern Sindh province. According to reports, over five million people are affected by the floods, with 1.8 million people displaced from their homes. About 700,000 people are in refugee camps, 67 per cent of food stocks have been destroyed, and nearly 37 per cent of the livestock has been lost or sold to avoid being lost. The disaster comes a year after the worst flooding in Pakistan's history; in 2010 one-fifth of the country was underwater, and over 20 million people were displaced. Canadian Foodgrains Bank is responding by supporting food distributions of wheat flour, pulses, oil and salt to 16,000 people in Mirpukas and Umerkot districts—places where it has been working on food security projects with Presbyterian World Service and Development and Church World Service Pakistan/Afghanistan since 2007. Among those displaced by floodwaters are Jam Joseph, his wife, Mebhai, and their four children. As water approached the village, the family used a boat to get to the higher ground where they have been living for the past two weeks. "Everything has been lost now," Jam says, pointing in the direction of their submerged village. "Three acres of my crops have been submerged in water, and we have lost the wheat we were saving." Jam and Mebhai both worry about a shortage of food. "We do not have crops; we had saved sixty maunds (2,400 kilograms) of wheat stored for food, and that is gone." Jam's family was benefiting from the Foodgrains Bank-supported food security project in the district, which helped them access agricultural resources such as training, improved seeds, and better access to irrigation water. The project also helped Mebhai to set up a small-scale business. "I earned 200 rupees ($2.22) per week through the shop I operated," she says. Like most flood survivors, Jam carries his national identity card in his pocket. "This is all that I have," he says. "I made a trip back to our village and could not see any of our belongings. There is still about three or four feet of water. I pray our belongings are still there." Until the water goes down, Jam will be unable to work his land. "We need help until we can go back to our normal life," he says. For Jam, Mebhai and others displaced by the flood, food concerns and lost possessions are not the only worry. "In the evening, snakes and scorpions come here, so we have raised the ground where our children sleep," he says of the challenges of living under open skies. "The snakes and scorpions get trapped in the low-level passage." Jam has also developed a skin rash. "Never before have I had this," he says. "It is because of the unclean water that surrounds us." He expects it will be at least six months before the family can return home. Then, he says, "we will have to rebuild everything." Canadian Foodgrains Bank is committed to supporting people like Jam and Mebhai in the long term. Food items are currently being purchased, and will be distributed to those in need in the coming weeks. These projects are supported by the Canadian International Development Agency. People who want to help people in Pakistan through the Foodgrains Bank can give by calling 1-800-665-037, by visiting www.foodgrainsbank.ca or by sending a cheque to Box 767, Winnipeg, Man. R3C 2L4. 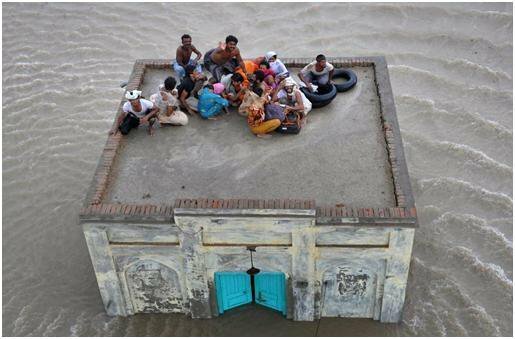 Donations should be marked for Pakistan Flood Relief. The Canadian Foodgrains Bank is a partnership of 15 churches and church agencies working together to end global hunger. Together with matching support from the Canadian International Development Agency (CIDA), the Foodgrains Bank has provided over one million tonnes of food assistance to people who are hungry since 1983.